"This is great salad for a potluck or BBQ. I always get lots of compliments and requests for the recipe. Ensure that dressing is thoroughly mixed before tossing with salad, it will separate while chilling." Whisk onion, sugar, apple cider vinegar, canola oil, yellow mustard, salt, celery seed, and black pepper together in a bowl until well combined. Chill in refrigerator at least 2 hours to blend flavors. 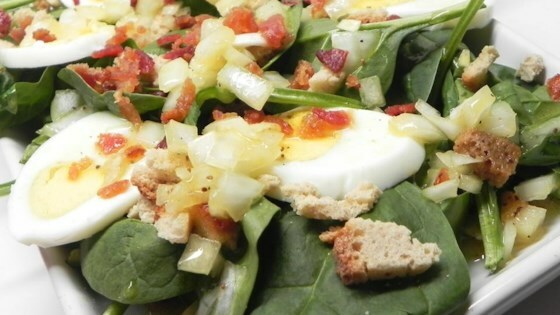 Mix spinach, stuffing mix, eggs, and bacon together in a large bowl. Add dressing and stir to coat. Easy. Fast. Excellent flavor. I subbed agave for the sugar. Wow - this is delicious! We are low-carb, so I used Stevia instead of sugar and left out the stuffing - and it was PERFECT! Huge hit - thank you! This salad was delicious! Thanks for sharing! Excellent Salad. I did not have any stuffing so I added some slivered almonds and tomatoes. Also did cut the sugar in half. This is a keeper. Tasty, tangy salad dressing and a delicious combo of toppings make this salad delightful! My husband and I loved it. I wouldn't change a thing. This salad was amazing! It can be great as a dinner on its own or as a side dish. I will absolutely make this again!